So Backlash was terrible. We covered it in details on our LIVE post show. How will Smackdown recover from the shitshow? Will they make any changes? Did they even realise? Who knows? Let’s see what they do anyway. We’re on the road to Money In The Bank. Paige opened the show and started that the first co-branded PPV was a smashing success. Really?? Did you see all the people leaving during the main event? They really are living in their own bubble in WWE. This should have been a wakeup call. Don’t patronise us. Paige does confirm some confusion from Raw in regards the Money In The Bank matches. There will be 2 MITB matches which will be cross brand and the winners will bring the contracts back to their brand so it seems like the title shots aren’t against a champion of your choice. It was also confirmed later on in the night that the matches would have 8 competitors each in them, 4 from Raw, 4 from Smackdown. I don’t like the new briefcases, the text is too big on them. They look stupid. Anyway, enough complaining. Smackdown was actually good this week. 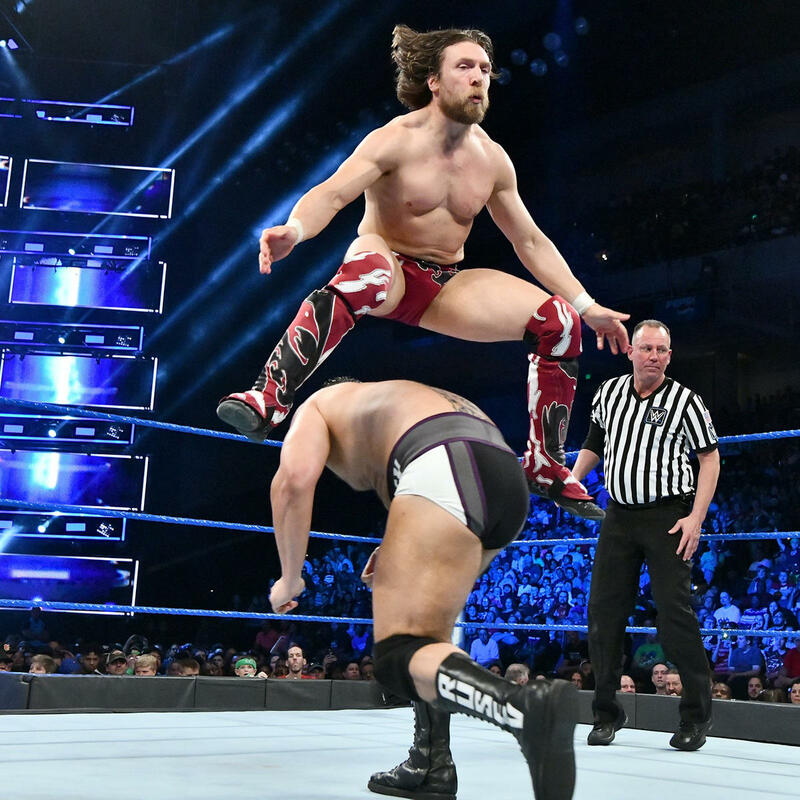 We had 3 MITB Qualifier matches on this week’s Smackdown, 2 for the men, 1 for the women. Jeff used Fly. It’s Super Effective. First up in the men’s MITB Qualifier matches,we had Jeff Hardy vs The Miz. It was a really good match. Captain Unicorn Arms (as Corey Graves so eloquently put it) managed to hit a Twist of Fate before Miz rolled away before he could follow up with a Swanton Bomb. Jeff got dropped neck first onto the apron. Miz got dropkicked while he was lying on apron and smacked off the floor. Jeff hit a Sunset Flip Powerbomb from top rope. 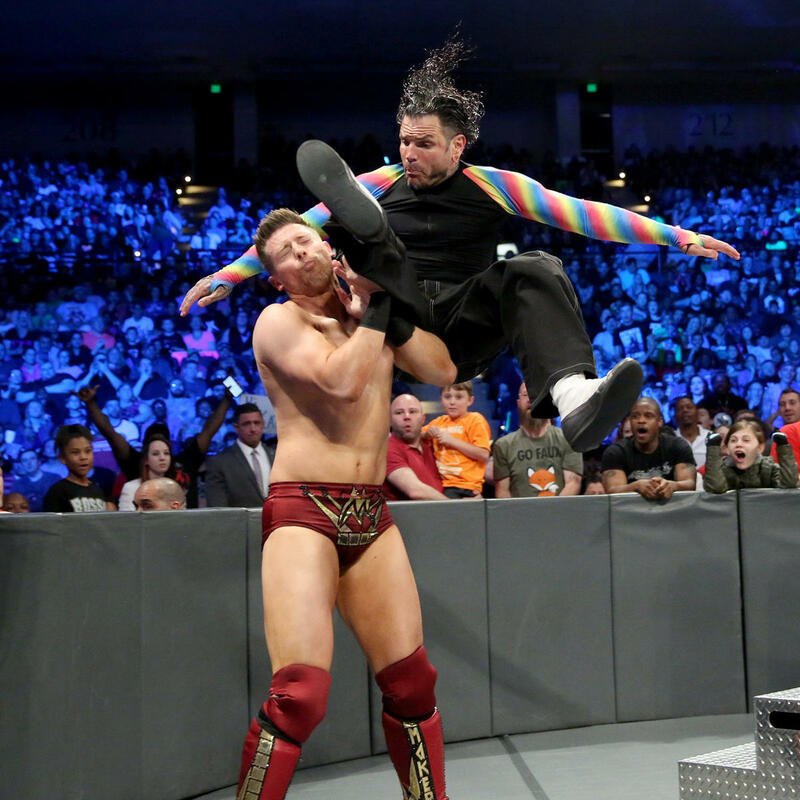 Jeff almost picked up the win after another Twist of Fate into an actually hit this time Swanton Bomb but on the 2 count, Miz reversed the pin and rolled Jeff into a pin of his own for the 3 count. Great opening match and set the show off on a good note. The Competitive Leapfrog Competition was going great for Daniel. Aiden English cut a heel rap on the crowd before the match getting the crowd against Rusev. Another good match here with highlights being Bryan going for a Suicide Dive, getting caught, and then thrown on announce desk. Daniel doing all his running dropkicks, yes kicks etc. Rusev’s wrist got worked over so he wasn’t able to lock in the Accolade. Daniel got the Yes Lock but Rusev got the rope break. English saved Rusev from the Running Knee. Bryan hit a baseball slide on both of them. Followed by a Running Nnee to Rusev on the outside. D Bry then hit a Missile Dropkick (I didn’t think he’d do that anymore). Rusev got Daniel with a Knee to his injured ribs, followed by a Machka kick for the 1,2,3. So that’s Braun Strowman, Finn Balor, The Miz and Rusev in the men’s MITB match so far. I’m torn over whether I want Balor or Miz to win from that list so far. I feel Rusev probably needs it more. In the sole qualifier for the Women’s MITB match, Charlotte Flair faced Peyton Royce (they both have last names, it’s a novelty). The IIconics cut their usual insulting promo before the match saying that Charlotte was an inspiration as Billie’s uncle Craig lost his stutter due to laughing at Charlotte losing. Peyton tries to copy the Charlotte loss look but decides that it’s only funny if Charlotte does it so Peyton says she will make her make the face again tonight. I don’t have a funny caption for this one. Just WOW!!! Another good match here where Billie Kay gets involved as you would expect. Charlotte takes out Billie with a dive over the top. Peyton then takes out Charlotte at ringside with a Neckbreaker. The ref gets distracted, Billie drops Charlotte on the rope, Peyton kicks a Spinning Kick but only gets a 2 count. Charlotte goes for a moonsault but Peyton gets her knees up. Those knees then connect with Charlotte’s face for a 2 count. Charlotte hits a Spear but only still gets a 2 count. Charlotte finally manages to pick up the win with a Figure 8. So Charlotte joins Ember Moon as the only 2 confirmed participants in the Women’s MITB match so far. 6 more to go. 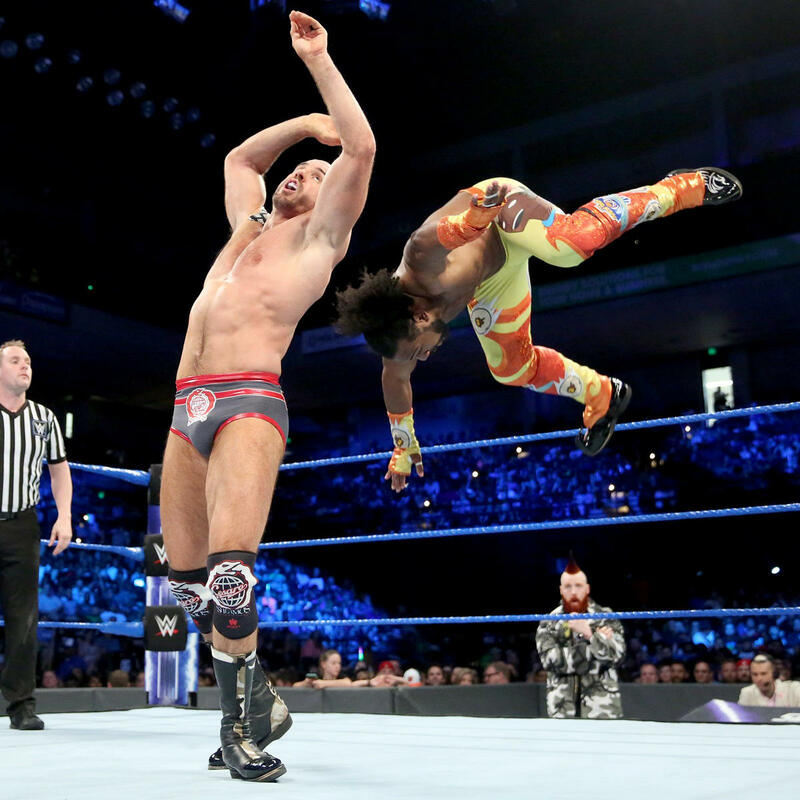 Both AJ and Nakamura were declared unable to compete on Smackdown due to all the shots to the talliwhacker they took on Sunday. They did both have interviews with Renee Young however. Shinsuke was asked if the issue between them was over. He replied “No……..speak English.” When Renee questioned him on how he used to be able to speak English, he replied “I learn English, but I’ve forgotten it. So now No Speak English.” I love heel Shinsuke. He then talks about nuts. Read into that what you will. In AJ’s interview, he says that he will fight dirty if he needs to and will step back in the ring with Nakamura. Hopefully he will bring a cup next time. How has he not worn a cup yet? There was no tag team stuff at Backlash so they tried to get a lot of it in on this show instead. Sheamus was eating Lucky Charms backstage because he was depressed about losing to Woods last week. Cesaro says it wouldn’t have happened to him if he had been in the match. Sheamus says that Cesaro should face Woods this week in thst case. We then discover that Cesaro and Sheamus’s bags are filled with pancakes. The match happens because apparently Sheamus can make matches now. Sheamus tries to distract the ref, Cesaro tries for a pin with his feet on ropes but Kofi shoves them off. Sheamus tried to make another distraction on the apron but Big E throws pancakes at him. Kofi then takes Sheamus out. Woods tries for his Springboard Elbow Drop but Cesaro jumps up and gets him with an Uppercut getting the 3 count. Next week from London, it’s going to be The New Day vs The Bar. The winning team gets 1 member entered in MITB ladder match. I’m guessing The Bar will win that and cause some tension between them. Carmella had a selfie promo where she informs us that she beat Charlotte Flair. She’s gonna have a party in London, not in Baltimore. Also she beat Charlotte Flair. We are getting a Royal Mellabration next week and the royal family aren’t invited. Either is Ric Flair. Also she beat Charlotte Flair. Speaking of Selfie promos, Tye Dillinger, Naomi, Shelton Benjamin and Asuka also had some hyping themselves up for Money In The Bank. Only Asuka had text on screen which is kind of understandable. Accent and all that. A Fiery Fireball comes flying straight towards Mandy Rose’s face. FIRE!!! 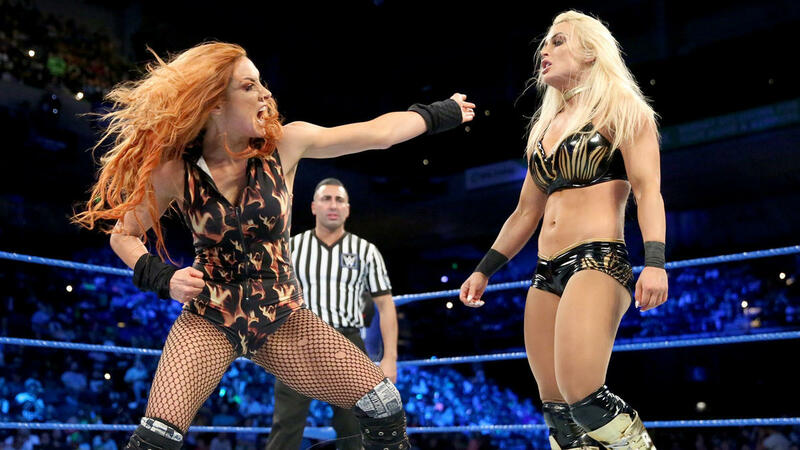 The other match on the show was Becky Lynch vs Mandy Rose. Paige stops Mandy and Sonya in Gorilla before they go out. She tells them once again that Absolution is dead again. They say that they won’t abandon each other. She tells them that Sonya is barred from ringside. Sonya has new entrance music, and a nice slow blurry entrance. Mandy wins the match with a rollup after bouncing Becky off throat first off the ropes. I’m not sure they are burying Becky but I hope it’s to not expect it when she wins MITB. The wrestling show is back!!!. This was a great Smackdown. It had 5 matches, all of which were good to really good. No in ring interview or promo segments bar Paige’s opening. I wanted Smackdown to be the Wrestling show after the brand split and now that the godawful Backlash nonsense is out of the way, it looks like we are finally getting it. We’ll leave Road Dogg alone for this week. Just keep it up. Fancy testing your wrestling knowledge, and proving you know more than your friends? Of course you do! Then you should check out our weekly wrestling quiz, posted every Friday (kinda). The latest quiz was our Wrestlemania quiz, and you can check it out here.